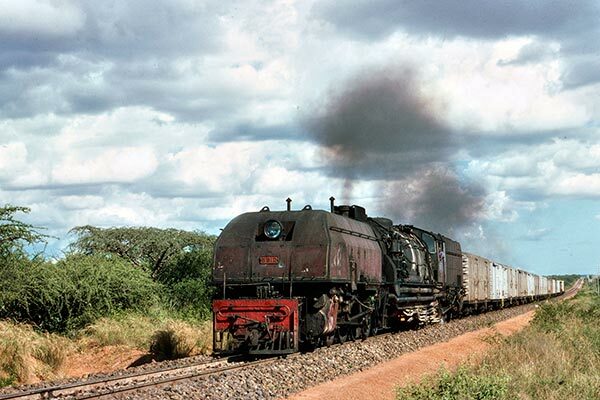 Caption - Kenya's metre gauge steam included the 59 class 4-8-2+2-8-4 Garratts. The 34 locos were built by Beyer Peacock in 1955 and 1956. They are the heaviest metre gauge locos in the world at 252 tons! The 59s worked the heaviest trains from Mombasa (at sea level) to Nairobi (just under 6000 feet above sea level) facing gradients of up to 1 in 60 with their 1200 tonne trains. The journey took between 16 and 24 hours and each 59 had a team of two crews who took rest in a caboose at the back of the train. This picture was taken in December 1977 and shows 5912 heading up the 'hill' a few hours into its journey from Mombasa.